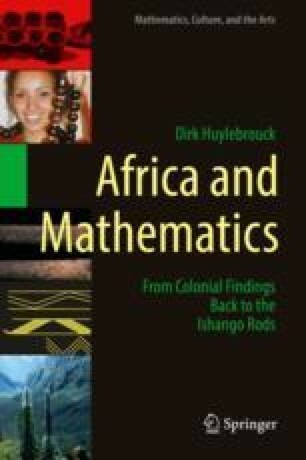 A classical objection against the assumption of a mathematical activity on the Ishango rods is the absence of writing, which seems indispensable for a reasoning deserving a “mathematical” label. Thus, the fifth chapter provides examples of the execution of a multiplication on the hands, a report about an African counting genius and examples of African games of strategy. Here, the necessity of notational methods emerges, on ropes, wooden objects and bones. Some exceptional objects from the Belgian Africa Museum of Tervuren are depictured for the first time in this book. They sometimes unmistakably look like the Ishango rods.